Cheryl Cole, performing on The X-Factor, Sunday. Cheryl Cole, or Tweedy or whatever she is this week, rather unsensationally mimed to a song that was pre-recorded before going out 'live' on X-Factor. The new single was to be performed by the X-Factor judge live on the results show. But bosses decided it would be too much to expect Cheryl to rush about and change costumes, then perform an energetic showpiece, between judging the contestants. Ms Cole, who changed costumes in the space of 12.6 seconds between every song on the Girls Aloud tours, was unavailable for comment from her hotel, although a recording stated something quite unintelligble, in Geordie. Nothing unusual there, it would seem. Producers of the X-Factor told us "Ms Cole-Tweedy is a fine performer. 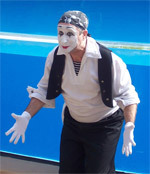 Many acts mime in this modern age of energetic dance routines. Plus, she can't actually sing. What would happen if we were to unleash that on the audience, and then she sits there in judgement over one of the contestants. We'd lose credibility in a second! You're not recording this are you...where did you say you're from again?" Official statements maintain that 'Cheryl may not have sung every single note', but our sources, who have now studied the video footage, have concluded that she mimed to all but one small sequence in the middle of the song. This sequence is easily identifiable, because it goes from being in tune, to horribly out of tune, breathy, raspy and loud, back to pitch perfect and in tune. Still, we shouldn't be that surprised. I mean, a singer in the charts that can't sing live? Whatever next? We'll be giving a million pound record contract to a gameshow contestant!